Do it yourself blemish remover? Oh yeah, now we are talking! If you’ve been around my blog for a while you probably remember why I’m grateful for my acne. And it’s true, my blemishes have been a key navigation tool in helping me find better health. But, come on. Just because am grateful for my bad skin doesn’t mean I want bad skin. The truth is that my skin has improved dramatically since I’ve embraced real food, ditched toxic chemicals, and embraced a more natural approach to health. This isn’t surprising when you consider how our diet affects our skin. But I’m still far from perfect and I have a lot of internal healing to do (too many years eating junk “health food” will do that do you). So even though my skin is a lot better, I still get the occasional blemish (yes, even in my thirties). Enter my lavender and tea tree blemish remover! This little recipe is great. Definitely better than any chemical-laden stuff you can buy. These two oils are perfect for supporting healthy, glowing skin. They are perfect for this blemish remover. The jojoba oil is also great for acne prone skin. The rosemary and lemon are both invigorating. They help stimulate the lymphatic system which is key to getting rid of toxins in the body… one of the key components to blemishes in the skin. Boo-yeah! 1. 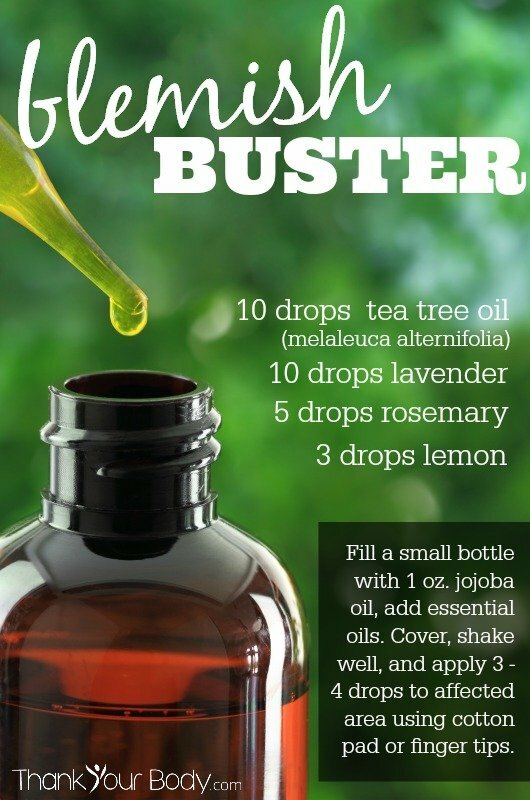 Fill a small bottle (1 ounce size is perfect if you have it) with the jojoba oil. To use: Apply 3 – 4 drops to a cotton pad or finger tips and apply to affected area.